We previously shared how to boost employee engagement and specifically how to use digital signage screens to improve employee communication. The common ideas being that digital media, social media, and digital signage are powerful tools for an organization's Comms or HR team to reach employees. In this article I'll share specific workflows of how a few Comms team use Spotlyte to effectively communicate and broadcast information to their employees. This particular organization has a single main headquarters, but offices dotted all around the country. In each of their offices they have screens setup throughout the hallways and meeting rooms. They have a distributed comms strategy, with different regions and offices managing site specific employee communications, with the main comms team managing corporate information. They also had existing workflows of communicating and collaborating using cloud storage providers such as Box, Dropbox, and Google Drive. In this particular case, they were Box users. It was simpler to train their comms team on a single collaboration tool that the team was already familiar and using for other purposes. So populating their screens is just a matter of dropping content into a shared Box folder. With these Box folders and their associated synced Spotlyte, they could create schedule loops of corporate content from headquarters, followed by regional content, followed by specific office content. With each group of content dynamically managed and owned independently by various team members closest to that particular region. This type of setup allowed maximum flexibility with their comms team, and enabled them to be very effective in broadcasting and reaching all their employees. They then additionally kept their feeds dynamic and live by including their company's official social media feeds, as well as hashtagged content from their users. This company has a main headquarters but several different locations within the building where they wanted different content broadcasted, including public spaces. 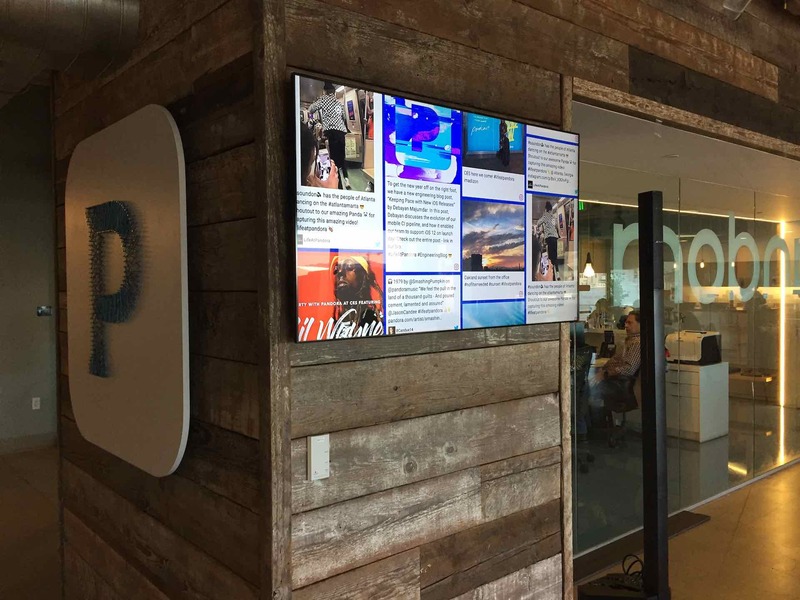 They had a few team members on their comms team responsible for the digital signage content, so was able to take advantage of the Teams feature in Spotlyte to manage and curate content as a team. With the direct upload feature, the team members created a single Spotlyte where they uploaded their corporate slides and notifications including sign up dates and deadlines. They also created another Spotlyte mainly to highly employee culture where they uploaded special pictures of employees representing and exemplifying company culture. Then using the Spotlyte Scheduler, they mixed in a third Spotlyte that contained user generated content from their customers showing their appreciation for the product. As explained by the comms team, this was a great way to show employees the product and end result of their hard work and dedication. This small startup had their office space, but mainly needed to broadcast content to their warehouse employees who weren't accustomed to checking company email daily or have access to the intranet for important company communications. Critical gaps in employee communications can often lead to problems for the individual worker, as well as for the organization. This team was looking for a simple and effective way to broadcast information onto several screens spread throughout their warehouse. They used the simplest Spotlyte setup with a single Spotlyte and the custom upload feature to upload corporate slides to display in a loop to their warehouse screens. This allowed their HR team to easily and quickly publish relevant and timely information to their warehouse employees. In this article I focused primarily on the communication through digital signage screens, and sharing corporate communications through TV screens. Don't overlook your internal intranet and newsletters, as those are effective channels of outreach also.